A change in Tarzan will do the world of good. This is the first non- Johnny Weissmuller film in the series and its a bump up from the previous entries with less a sense of being by rote even if it is. The plot has a note book belonging to a long missing actress/heiress being discovered in the jungle. When tarzan gives it to the authorities he finds out that there is are several rewards for her return including one because she can get a man out of prison where he's been for 20 years. Tarzan doesn't let on that he knows where she is and goes to ask if she would return with him. She does and the fact she looks 20 years younger than she is leads everyone to suspect that she is where the fountain of youth can be found. This sets the baddies into action. When the actress returns with a husband wanting to go home Tarzan refuses to take her. 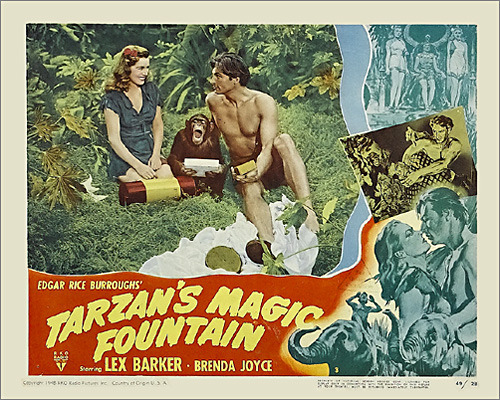 Jane horrified at Tarzan's attitude agrees to try to get them there. Of course the baddies follow. Lex Barker starts his stint as Tarzan in this film and he is actually quite good. Much more serious than Weissmuller had been at the end of his run he brings gravity back to the role. He is helped a great deal by the production which takes the by rote plot line an adds in some real chills and excitement. Nothing like flaming crossbow bolts through your chest to ruin a day. Here for the first time in long time you actually worry if someone is going to get hurt. After going through the previous 12 films I found my attention flagging toard the end. To be honest the last ouple or so films were tough to get through. Had I not been doing all of the films I ould have bailed and gone on to other film before eventually circling back. Seeing MAGIC FOUNTAIN my desire to keep going was renewed. I found why I like these films all over again. I can't ait to see what's next.